MapsGalaxy Toolbar is the PUP that uses misleading techniques to prevent removal. Use Reimage to locate malicious components and get rid of them faster than with uninstall instructions. A full system scan blocks virus reappearance and prevents traffic to malicious domains. 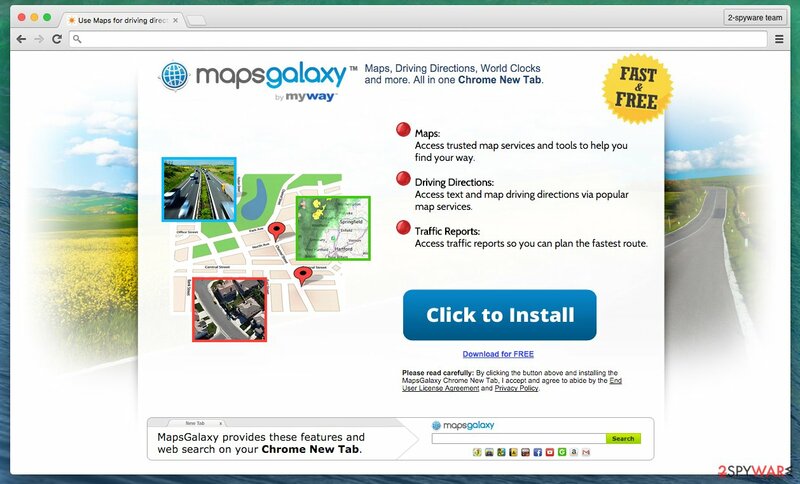 Maps Galaxy is a questionable browser extension that allegedly helps users get around with the help of maps, directions, street views, etc. Nevertheless, the app can infiltrate the system without your approval and soon after that initiate suspicious activity related to redirects to sponsored websites, intrusive advertisements, and slow downs on each of web browsers. MapsGalaxy is set to control victim's search results, alter the homepage, the default search engine and similar system settings. The program was created by Mindspark Interactive Network, a New-York-based developer, which is also responsible for TaxCenterNow, My Forms Finder, and GetPoliticalNews browser hijackers. Compatible browsers Google Chrome, Internet Explorer, Mozilla Firefox, etc. Symptoms Altered homepage and new tab, not genuine search results, intrusive ads, etc. Interestingly, according to the statistics, not many PC users make use of the mentioned features. In fact, over half of the people who installed the software do not recommend it for others and suggest to get rid of it right away. Due to the questionable distribution tactics – sudden appearance on the computer – users tend to call the extension “Maps Galaxy virus.” And there are a few reasons why you should remove this extension from the system. Also, it may alter system settings by embedding 39SrcAs.dll in the browser and using it as a search hook which then redirects to unknown URLs. Different antivirus software detect this file as Win32:Mindspark-A [PUP], Zango, Adware.Win32.Mindspark.81, Adware/WebSearch, etc. 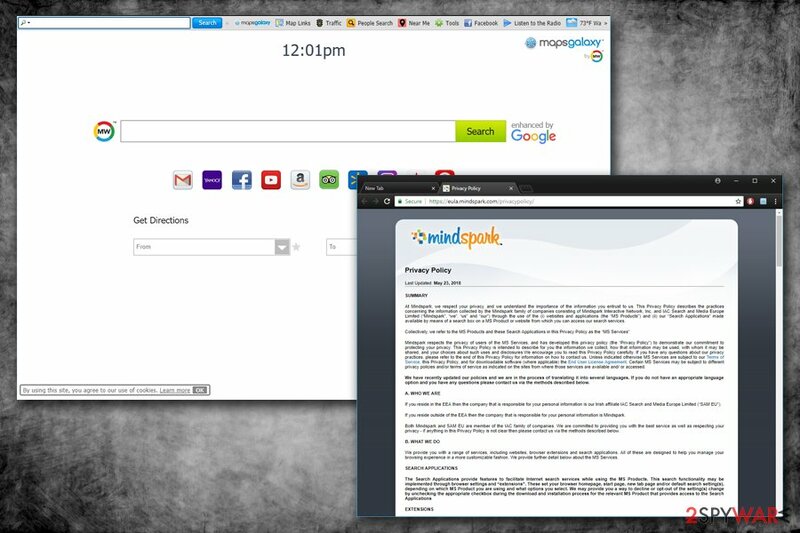 Maps Galaxy also replaces user's current homepage to home.mywebsearch.com (which is an equivalent to Myway search) and the default search engine to mywebsearch. This search engine is known to be displaying a lot of sponsored search results though is not malicious itself. Beware that you may also notice that your new tab page and browser window may also be altered by application. We may collect information from you that may identify you, such as your name, address, email address, and telephone number and anonymous Information, such as the number of your page views, link clicks, and login times. We may use information that we collect about you to […] Enable us and our search and advertising partners to develop and display content and advertising tailored to your interests when you use the MS Services, other websites and services, or mobile applications. In this image you can see MapsGalaxy Toolbar download page installation screen. The product developers will try to create an impression of a trustworthy software. MS Products are exposed to various security issues, and should be regarded as unsecure. You can install this toolbar on your computer from the official developer's websites maps-galaxy.com or mapsgalaxy.com. However, we don't recommend doing so because you may run into previously mentioned problems. Besides, you may notice that you are dealing with this issue without installing this app because it seems that not only its official website promotes it. It MIGHT be that Maps Galaxy is capable of entering your computer together with other software as a “recommended download.” However, it is considered to be a legitimate distribution technique. Many computer users end up with additional applications on their computer because they tend not to follow the installation process carefully. “How to remove Maps from Windows 10?” This question bothers a lot of users. Luckily, security experts always have a solution at hand. As we have already mentioned, you can remove MapsGalaxy and its components or related programs easily if you use trusted security tools for this purpose. We also recommend eliminating YourVideoChat, SoccerInferno, Search-Results and other PUPs that you cannot remember installing. In case the antivirus tool fails to detect the unwanted program, don't lose hope — you still can perform MapsGalaxy removal manually. Below we provide more detailed instructions what specific files to looks for and how to restore your system after the elimination. In order to uninstall MapsGalaxy from your PC manually, you must make sure you eliminate all the malicious files the toolbar drags along with itself on your computer. Be sure you don't miss the following files: 39bar.dll, 39SrcAs.dll, 39SrchMn.exe, 39medint.exe, 39barsvc.exe, 39brmon.exe, 39brmon64.exe, APPINTEGRATOR.EXE and AppIntegrator64.exe. These have been indicated as malicious by no less than 8 different security software. Here, look for MapsGalaxy Toolbar or any other recently installed suspicious programs. Wait until you see Applications folder and look for MapsGalaxy Toolbar or any other suspicious programs on it. Now right click on every of such entries and select Move to Trash. When in the new window, check Delete personal settings and select Reset again to complete MapsGalaxy Toolbar removal. 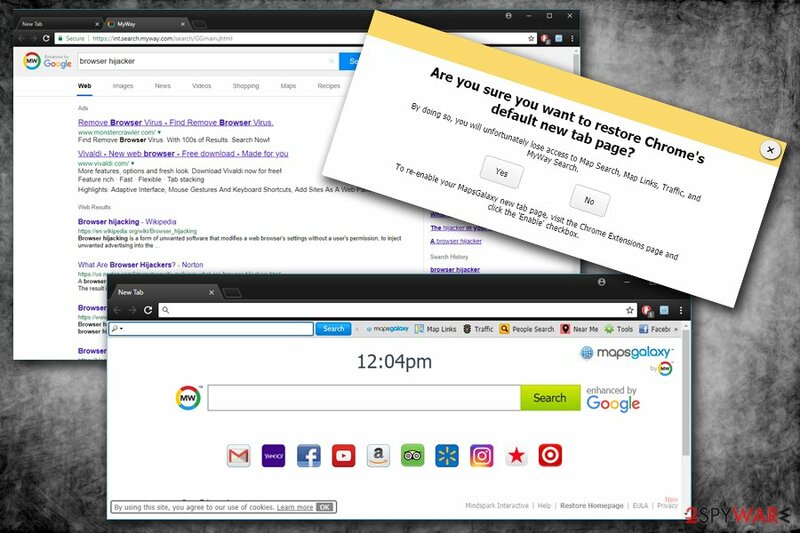 Once these steps are finished, MapsGalaxy Toolbar should be removed from your Microsoft Edge browser. Here, select MapsGalaxy Toolbar and other questionable plugins. Click Remove to delete these entries. Now you will see Reset Firefox to its default state message with Reset Firefox button. 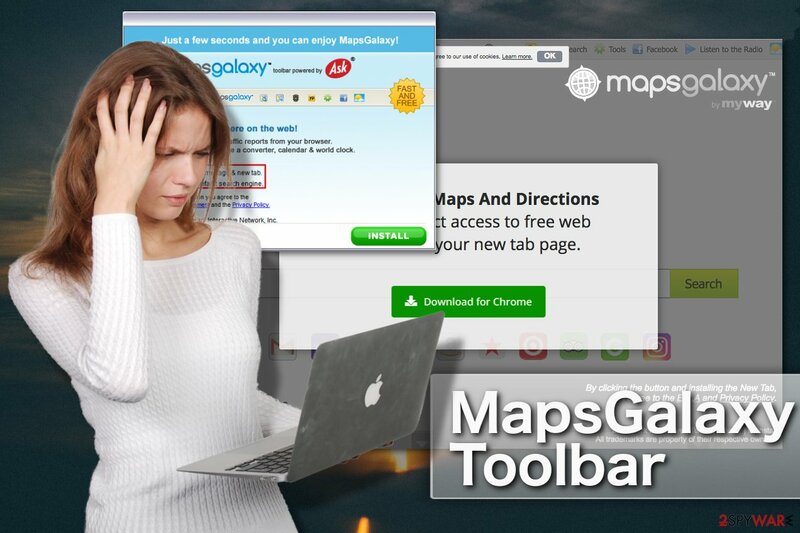 Click this button for several times and complete MapsGalaxy Toolbar removal. Don't forget to reset Google Chrome! Before performing the reset, delete any unfamiliar extensions, add-ons or browser helper objects. Here, select MapsGalaxy Toolbar and other malicious plugins and select trash icon to delete these entries. Click Reset to confirm this action and complete MapsGalaxy Toolbar removal. Here, select Extensions and look for MapsGalaxy Toolbar or other suspicious entries. Click on the Uninstall button to get rid each of them. Now you will see a detailed dialog window filled with reset options. All of those options are usually checked, but you can specify which of them you want to reset. Click the Reset button to complete MapsGalaxy Toolbar removal process. This entry was posted on 2019-04-01 at 01:55 and is filed under Stealing programs, Viruses. You can quickly scan the QR code with your mobile device and have MapsGalaxy Toolbar manual removal instructions right in your pocket. How did you remove MapsGalaxy Toolbar?